REMKE DELIVERS INDUSTRIAL-STRENGTH CORD GRIPS, CABLE CONNECTORS & CORDSETS WITH PERSONAL SERVICE, ORDER FLEXIBILITY AND CUSTOM SOLUTIONS. Remke has been manufacturing electrical connectors in Chicago for over 50 years. Our only mission is to deliver industrial-strength cord grips, wire mesh grips and molded cordsets. This focus has created one of the largest and most diverse lines of electrical connectors available. When the product you need doesn't exist in the standard line, talk to us! Remke Engineered Solutions is entirely focused on meeting the needs of a single customer. Developing application-specific solutions that meet your precise needs is job 1 and no order is too small. Our broad spectrum of customization options is like a sliding scale … from simple to complex. We can take a stock connector and make slight modifications, adaptations & variations or engineer fully-custom connectors and cable assemblies. From high-humidity to high-powered washdowns, harsh chemicals to relentless salt water, Remke IP and NEMA Rated stainless steel cord grips create durable electrical connections in demanding applications. Molded connectors on a feeder bowl. 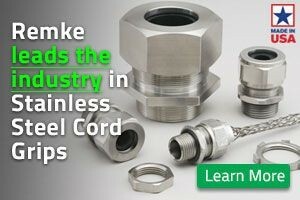 What sets Remke apart from other electrical connector manufacturers? Focus, depth, flexibility and service. We exist to provide electrical connectivity solutions that meet the unique needs of each and every customer. Now you can shop online, flip through the pages of our e-catalog online, or get a printed catalog sent to your door. No matter how you want to browse and buy, Remke is ready!